Nos dedicamos a las escaleras de todo tipo para interiores y exteriores de madera, metal y vidrio. para viviendas, comunidades, locales comerciales, etc. - Somos fabricantes y también trabajamos con otros proveedores. - Reparamos y forramos escaleras deterioradas - Hacemos torneados para barandillas, patas de muebles, etc.. (tenemos torno propio) Durante muchos años hemos trabajado y seguimos haciéndolo, para conseguir satisfacer las necesidades de nuestros clientes y poder ofrecer la mejor calidad y durabilidad en la fabricación de nuestros productos. Además de nuestras escaleras artesanas ofrecemos una amplia gama de escaleras de diseño para interior y exterior, así como diferentes modelos de escaleras escamoteables para desvanes, terrazas, altillos, etc. Staircase designs also vary greatly – from the offbeat to the grandiose – making it imperative that you work with an Etxebarri, Basque Country, Spain designer who understands your style and can work to your budget. From treads and risers, to balustrades, banisters and handrails, the Etxebarri, Basque Country, Spain professionals in this category can design, supply and install stairs or the components that will complete your stairway to heaven. Whether you need to replace a handrail, want to update your glass balustrade, or need a complete stair installation, there’s a professional in Etxebarri, Basque Country, Spain who can help you through the process, from start to finish. 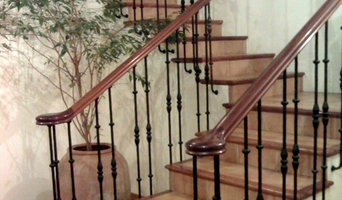 Find Etxebarri, Basque Country, Spain manufacturers, suppliers and installers of stairs on Houzz. Scroll through this page to find companies that manufacture, supply and install stairs in your area. You can browse their portfolios, read reviews and see how other tradesmen and homeowners rate their customer service, expertise and product. Here are some related professionals and vendors to complement the work of staircases & balustrades: Architects, Interior Designers & Decorators, Carpenters, Design & Construction Firms.